During my freshman orientation at Cornell (in the dark ages of the late 1960s), there were rumors that someone had already gorged out–and school hadn’t even started . There was at least one suicide my freshman year–which then Cornell Daily Sun Editor Sam Roberts wrote was the university mental health services’ fault. Sophomore year, I visited said mental health services–because I was afraid my boyfriend, who was smoking dope every night, was going to kill himself. He and his friends were totally depressed over the Vietnam War; they hated school but if they quit, they’d be drafted. March 27, 1968 Harv called me up and said he will kill himself if I won’t sleep with him. I said I will talk to him but he is a fool if he would kill himself. I told him I’d meet him at the Temple of Zeus. He walked up from Collegetown and I walked over to Goldwyn Smith Hall. He said he was really upset and, again, that if I didn’t go back to his apartment with him he ‘d kill himself. I am not going to anyone’s apartment who is going to kill himself so I said let’s go for a walk, and I walked him around the arts quad and up and down the road and into the basement of Morrill Hall, which is open at night and I lay there with him and yech I don’t want to think about it. Finally, he calmed down and I said are you OK, now, and he said yes, so I said I’d better go, which I did. Back in my room, I felt like I was cracking up. So I decided try again at the mental health clinic. This time, they had me see some social worker with little short gray hair and gray skin and sharp little features; she looked like a rat in a skirt suit. She asked me why I’m there and I told her I feel like I am going crazy. She didn’t say anything; just sat there looking at me. She didn’t seem sympathetic, and I didn’t feel like she would understand about Harv. Last term, when I tried to get help, the guy told me that if my boyfriend had a problem he was the one who had to come in. The story goes downhill from there…(with much black humor) but, as you can see, I lived to tell the tale, and, many years later, an Internet search revealed, to my relief, that Harv did, too. (He’s now a real estate lawyer in California). Still, the fear that Harv would take his own life prompted my involvement in protecting the black students who occupied the student union building, with rifles, the following year. And having a couple of friends take their own lives since that time has profoundly impacted my own life. I’m upset about the current spate of suicides at Cornell–but relieved to learn that these are the first in five years–and that Cornell’s suicide rate is actually below the national campus average. The study, by the Big Ten Conference, which researchers are now repeating, also found that the rate of suicide among students was half that of their corresponding age group in the general population. This means, the Chronicle reports, that colleges’ efforts to prevent suicide are helpful. And, in fact, in recent years, Cornell has been at the forefront of suicide prevention. The University has an “alert ” team to discuss possibly troubled students; a faculty handbook on picking up signs of distress; and a program that teaches custodians to look for warning signs. Cornell also offers walk-in visits at 20 locations across the campus for students who don’t want to use mental-health services. I’m glad that the University has gotten out front on this –by holding counselling sessions for students, by discussing the situation publically, by sending emails and videos to inform alumni, and by taking care regarding the manner in which memorial services are carried out. 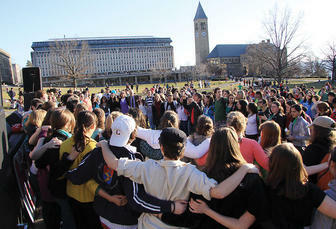 (The photo, above, depicts a recent rally aimed at lifting students spirits). I tend to agree with an alum who commented to the Cornell Daily Sun that the fences newly erected to keep people from jumping into gorges does not address the real problem (whatever that may be). But, mainly, I’d like to express my deepest condolences to the families and friends of the students who took their own lives, and my sorrow at young lives being cut short. Ithaca Diaries Blog is a publication of the Harris Communications Group of Cambridge, MA. We also publish HarrisCom Blog and NewCambridge Observer. ← People laughed…in the right places.